Vijaya Bank Admit Card 2019: Below are the admit cards published by Vijaya Bank - Vijaya Bank / www.vijayabank.com. The recent Admit Card issued for the recruitment drive is Sweepers Admit Card 2019. 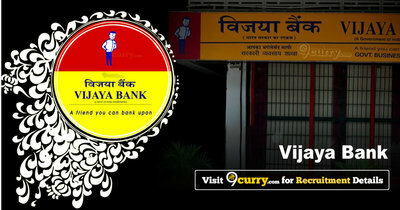 Vijaya Bank Sweepers Admit Card 2019: Vijaya Bank has issued the Admit Card on 21 Mar 2019 for the exam. Vijaya Bank Peons Admit Card 2019: Vijaya Bank has issued the Admit Card on 21 Mar 2019 for the exam. Vijaya Bank Assistant Manager Credit Admit Card 2018: Vijaya Bank has issued the Admit Card on 12 Oct 2018 for the exam. Vijaya Bank Manager Admit Card 2018: Vijaya Bank has issued the Admit Card on 28 Jul 2018 for Manager Examination 2018. Vijaya Bank Sportspersons Admit Card 2018: Vijaya Bank has issued the Admit Card on 08 Jun 2018 for Sportspersons Exam 2018.